This 250 count bulk pack of 12 gauge shells is splendid option for stashing away rounds without hurting the wallet! Spartan ammunition is made in Europe where shotgun crafting, hunting, and sporting is an absolute art. Each of these 2-3/4 inch length shells is loaded with 9 pellets of 00 buckshot which measure 8.38 millimeters in diameter. This is one of most common load profiles used by military, law enforcement, and private citizens for engaging dangerous threats with decisive response. While not advertised as low recoil, these shells have a powder charge in between low and high brass and are noted by shooters to produce slightly less recoil than a full power load. 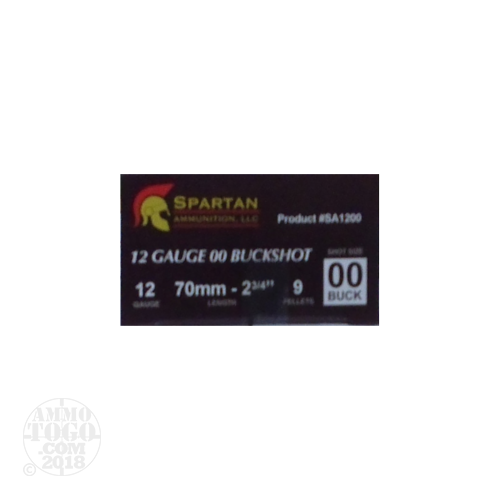 These shotshells are also built using standard 209 primers and moisture-resistant plastic hulls with a time tested six-fold crimp for dependable performance.